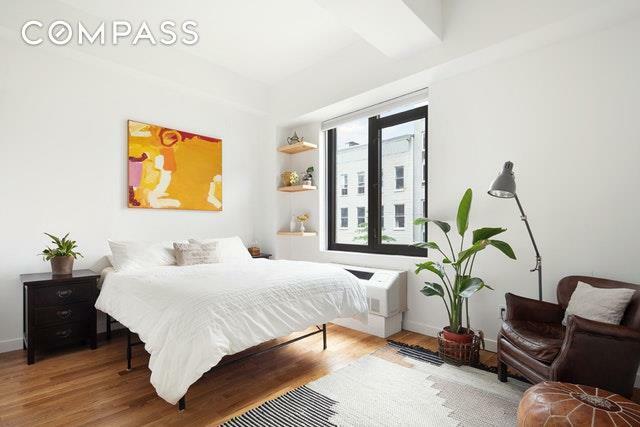 Welcome home to this sunny and elegant 2 bedroom 2 bath condo in one of Greenpoint's premiere condo buildings, The Pencil Factory (formerly the 1872 Eberhard Faber Pencil Company which converted in 2009). Spanning just under 1000 square feet, this beautiful home comes with large windows and overlooks tree-lined Java Street. 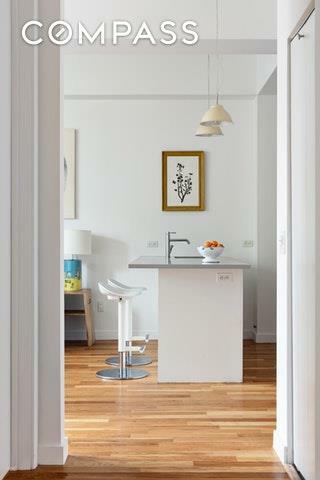 The open kitchen connects to the airy living room and features a large deep stainless steel sink, Caesarstone quartz countertops and stainless steel GE appliances. A long wide hallway leads you to the two true bedrooms. The very large and light filled master bedroom is truly its own suite with a hallway separating the bedroom and its luxurious en suite bathroom with a deep soaking tub, stall shower, and a Deca above-counter sink. The big second bedroom is large enough to formerly house two beds - is located across the hall from the second full bathroom. 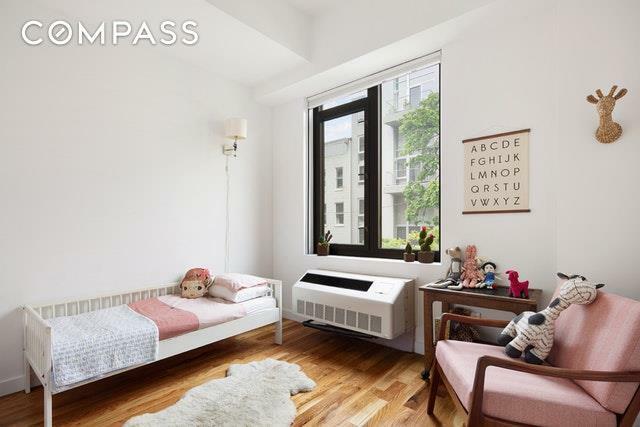 Wonderful details such as brand new oak hardwood-floors, Traco windows, Danze fixtures in both bathrooms, a Swedish Asko washer/dryer, and especially deep closet spaces throughout make this apartment luxurious and very special. The current owners have updated the apartment with new PTAC units, recessed lighting in the hallway, custom made carpentry shelving in the living room, and has been freshly painted. The Pencil Factory condominium features high-end amenities including elevator access, a gorgeous common roof deck with panoramic views of the Manhattan skyline, the East River and beyond, a virtual-doorman, a full-time super, gated private parking (there is currently an option to buy), a gym, a party room, a pool table, a package room, and rental basement storage (on a first come first serve basis) along with free bike storage. 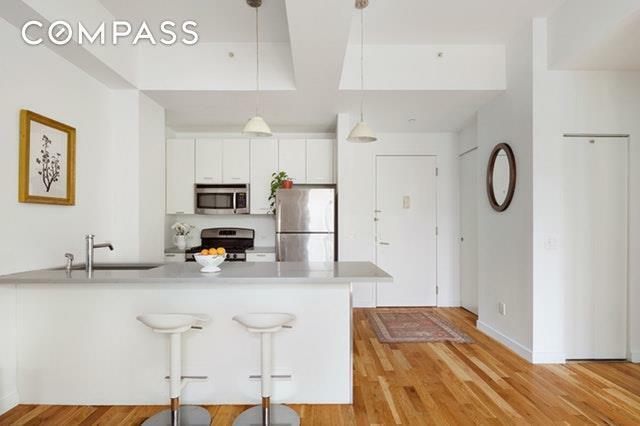 Just 2 blocks to the East River Ferry and 3 blocks to the G-train for an easy 20-25 minute commute to Midtown. Greenpoint is a beautiful and exciting neighborhood, and you'd be just a block from the wonderful and hot Franklin Street restaurants, bars, and shopping and a half block away from Transmitter Park and pier - a beautiful patch of green on the water to picnic and relax with views of Manhattan. Extremely low carrying costs with a 421Atax abatement in place through 2025. Pets are very welcome! Listing courtesy of Danielle Lurie of Compass.